Silver hallmarking in Ireland has been very similar to the British one since 1494. The evolution of the hallmarking system followed, although at different times, the English and Scottish ones (introduction of the standard hallmark, maker mark, date letter, and duty mark). Since 1807 the two systems definitively merged and also in Ireland the duty mark became the sovereign head, instead of the Hibernia which was then adopted as the symbol of the Assay Office of Dublin. After the act of independence (1922) the Irish hallmarking system did not substantially change, but (apart in the Northern Ireland where the British system was definitively adopted) in the Republic of Ireland an extra commemorative mark was occasionally struck, different from those used in the United Kingdom. In 1966 the Claidheamh Solais ('The Sword of Light') was struck to commemorate the golden jubilee of the 1916 rising. It was an Irish nationalist newspaper published in the early 20th century by Conradh na Gaeilge (the Gaelic League), edited from 1903 by Padráig Pearse, an Irish educationalist and barrister who later became a key figure in the Easter Rising in 1916. In 1973 the Gleninsheen Collar, based on a ribbed gold collar found in Gleninsheen, Co. Clare from the Late Bronze Age, 800-600 BC, was struck to commemorate Ireland joining the European Community. It was found in a crack in a rock. The farmer who found it thought it was the handle of a recently made coffin. It is now part of the largest collection in Europe of Ancient Gold objects displayed at the National Museum of Ireland (see a contemporary gold replica). 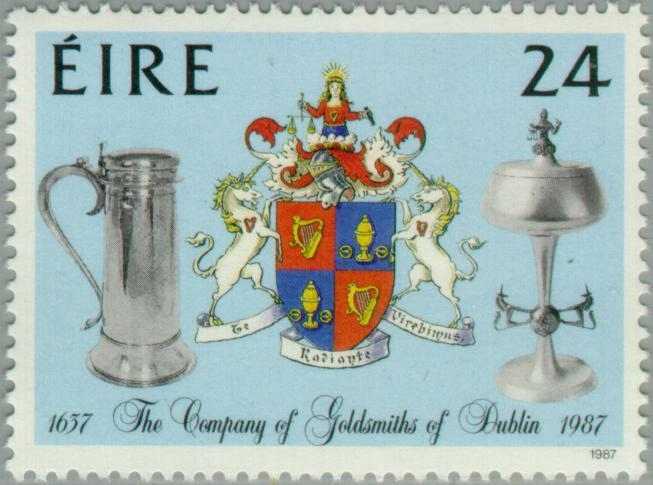 In 1987 the “Coat of Arms” of the Goldsmiths Company was struck to commemorate the 350th anniversary of the Goldsmiths Company of Dublin. 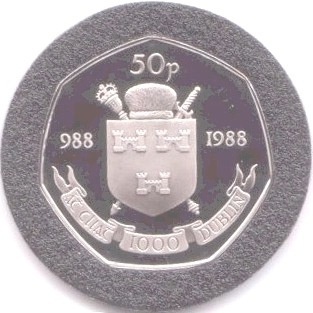 In 1988 the three castles (taken from the coat of arms of the City of Dublin) was struck to mark the millennium of the city of Dublin (learn about). From June 1999 to December 2000 the so-called M2 symbol, representing the transition to the new millennium was introduced to celebrate the new millennium. The table at the bottom of the page shows, in chronological order, the commemorative hallmarks used in Ireland after the act of independence dating 1922. All the reported commemorative marks have been drawn from samples found on-line. For a couple of them it was not possible to find real samples (this is a little known collecting niche). For these hallmarks a reconstruction was made by the author of this article on the basis of facsimiles reported by Ian Pickford, 1991. Pocket Edition Jackson's Hallmarks: English, Scottish, Irish Silver and Gold Marks from 1300 to Present Day. Antiques Collector's Club, Woodbridge, Suffolk (UK). Here are some examples of Irish commemorative hallmarks found on-line. The revolution Jubilee mark (‘The Sword of Light’) was struck on gold and silverware together with the date letter Y, from January to December 1966. Only 34,715 articles of silverware have been struck with this mark. 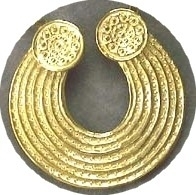 The 1973 'Gleninsheen Collar', Based on a Ribbed gold collar of Late Bronze age 800-600 BC, was struck on silver and gold articles in 1973 to commemorate Ireland joining the European Community. The commemorative hallmark for the transition to the new millennium was struck between June 1999 and December 2000. Golden Jubilee of the 1916 revolution. Ireland joining the European Community. 350th anniversary of the Company of Goldsmith of Dublin. Coat of arms of the Company of Goldsmith of Dublin. Millennium of city of Dublin. The so called 'm2' symbol. 1) the reported dates correspond to the date letter accompanying the mark. 3) 1987 and 1988 hallmarks are reconstructions made by the author of this article on the basis of facsimiles reported by Ian Pickford, 1991. Pocket Edition Jackson's Hallmarks: English, Scottish, Irish Silver and Gold Marks from 1300 to Present Day. Antiques Collector's Club, Woodbridge, Suffolk (UK). For the 1987 hallmark the image reproduced on a commemorative stamp was used; for the 1988 hallmark the image reproduced on a 50 p commemorative coin was used.